Masterpiece paintings from the medieval, renaissance and post renaissance periods. DURATION: 2.5 hours (standard tour for overview of the Italian masterpieces). For aficionados of art, the tour can be extended to explore other Italian and European masters. DESCRIPTION: One of the oldest museums in the world, the Uffizi contains the principal protagonists of the Italian renaissance, providing visitors with a thorough overview of the period as we weave our way chronologically through history with art as our guide. TICKET RESERVATIONS: We make the ticket reservations for your party in advance and the admission fees are paid on the day upon entering the gallery with the guide. Under 18years need their original passport to show as proof of age for the reduced ticket (needed for 13-17years inclusive). Tuesday is the busiest day of the week as the galleries are closed on Monday. During the very busy tourist season we strongly advise to avoid booking this tour on Tuesday. If you must visit the galleries on Tuesday, we recommend a start time of 8.30am. During the busy season there is very often a queue in the reservation area on any day of the week as well as the unreserved door, due to the numerous large groups and the sheer number of people with reservations for any given time. There is no further way to avoid this wait in the reservation area. In order to ensure a high quality standard for our tours and to limit this frequent, and sometimes quite long, wait in the reservation area, we recommend avoiding having the reservation entry time between 9am-4pm. We therefore, recommend an early morning start (the gallery opens at 8.15am) or a late afternoon visit, at 4pm. DURATION: 3.5 hours when the tour is of the Uffizi gallery and the Vasarian corridor. 2 hours when the tour is of the Vasarian corridor only (1 hour spent in the corridor and the other hour entering the Uffizi gallery and presenting the corridor in the historical setting. 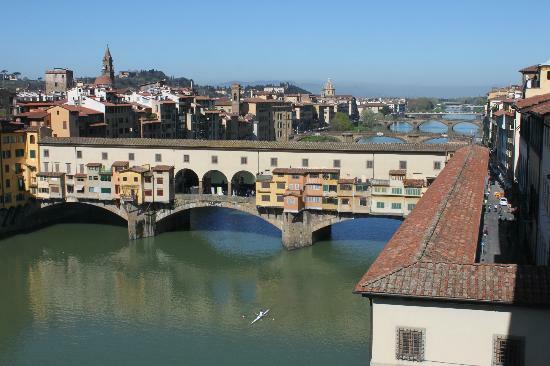 DESCRIPTION: Visit the great masterpieces in the Uffizi gallery and then walk through the private outdoor covered walkway of the Medici family which connected their office building(the Uffizi) to their Granducal palace (Palazzo Pitti). It is called today the Vasarian corridor after Giorgio Vasari, the court’s artistic director who planned and oversaw its construction in 1565. 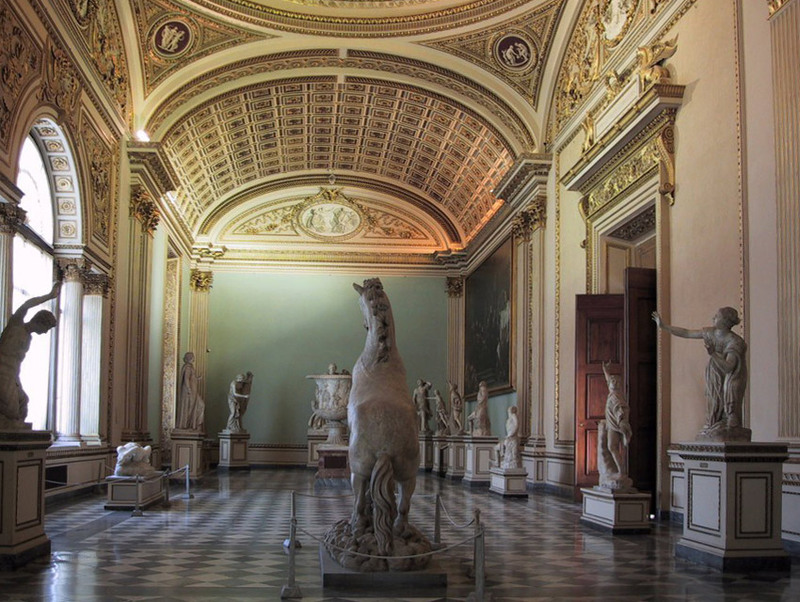 The entrance is from inside the Uffizi gallery and one exits the corridor into the Boboli Gardens of the Palazzo Pitti. The walls are lined with paintings, some of the family’s collection from the seventeenth and eighteenth centuries, as well as the largest collection of self portraits of artists in the world. There is no better way to step into the shoes of the grandukes of Tuscany than walking their most exclusive skywalk. The meeting point of the tour will be determined upon booking. All tours that we organise are private. We do not organise group tours. We do recommend a 3 hour tour of the Uffizi gallery (rather than the 2.5hours) for interested guests who love a good story and are interested in the Medieval and Renaissance periods because time flies by when visiting this gallery! So please let us know upon booking if you would the 3 hour tour length. The above prices are for the 2.5 hour tour only and do not include the admission fees to the gallery. Admission fees to be paid on the day at the ticket office with guide. We will make the ticket reservations for the gallery ahead of time to avoid the long lines. In high season there may be an unavoidable short wait in the reserved line due to the very busy tourist period. The reservation fee costs 4€ per person paid on the day when picking up the ticket with the guide. If someone booked with your party does not come on the tour, the reservation fee must still be paid. Please note: For parties of 6 people or more people Freya’s Florence will organise rental of personal headsets for use during the tour. Headsets cost 25€ for a half day tour of 10 people or less & 50€ for full day tour. The cost per person for parties greater than 10 people is 2,50€ for a half day tour & 5€ per person for a full day tour. March 1st -October 31st: Full price admission costs €24pp (ticket €20, reservation fee €4). November 1st – February 28th: Full price admission costs €16.50pp (ticket €12.50, reservation fee €4). Children from 6-17 years inclusive have free admission but reservation fee must be paid, 4€. Children under 6 years old are free and no reservation is necessary. European Union students 18 to 26 years old are eligible for the reduced ticket admission with a current student card. A copy (digital or paper) or original passport must be shown as proof of age for free/reduced tickets to the ticket office staff upon ticket purchase. Payment for the tickets can be made by credit card or cash. The above prices are for the tour only and do not include the admission fees to the gallery or corridor. 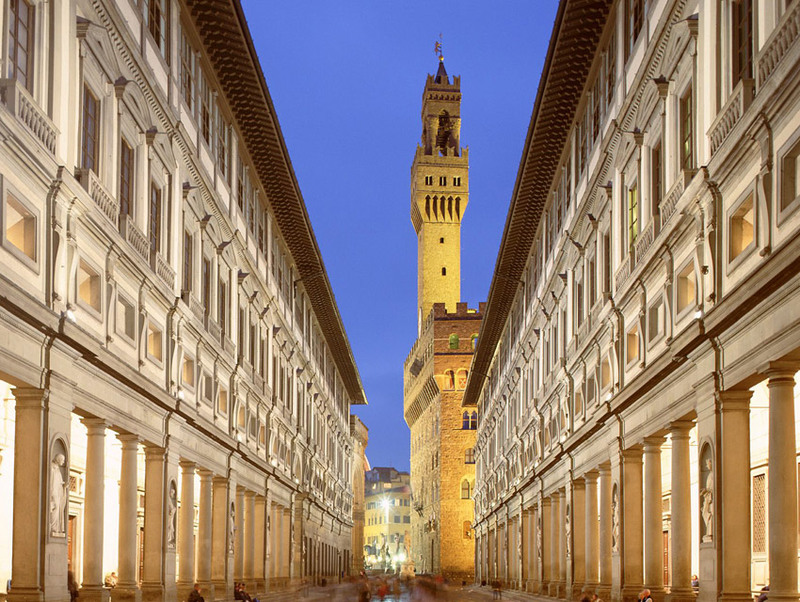 Admission fees: tickets for the Uffizi gallery (see above) are paid on the day upon entering the gallery + the Vasarian corridor cost is paid in full in advance of the tour date. The Vasarian corridor admission cost before it closed in 2016, was 483€ as a flat rate for 1-12 people. The museum has not disclosed what cost it will be when it next reopens. This fee was for the one hour walk through the corridor entering from the top floor of the Uffizi gallery and exiting at the Boboli gardens. Payment for the corridor must be made to the gallery in full before the tour date. We will make the booking for the corridor and send you the payment details. The fee increases for parties of 13 or more people and prices will be sent upon request. Under 18 years are free to state museums (Accademia, Uffizi gallery, Pitti Palace, Bargello sculpture museum) however, the original passport or a copy (paper or digital) of the passport is the necessary document to show as proof of age at the ticket office of each museum. Ticket reservations are necessary ahead of time at the Accademia gallery, the Uffizi gallery, the Medici chapels so as to avoid the very long lines of unreserved visitors. Freya’s Florence will make these reservations when the sites are included in the tour itinerary. All visitors over 6 years old must pay the 4€ for the reservation fee. Under 6 years are not required to have a ticket nor reservation. There are reduced admissions costs at other sites in the city upon showing proof of age. Groups greater than 6 people will require headsets, necessary for most of the museums and recommended for city walks due to surrounding noise. Freya’s Florence will book these in advance and they will be distributed at the beginning of the tour and used for the entire duration of the tour. For parties of 10 people and less the total cost for a half day tour is 25€ or for a full day tour the cost is 50€. For parties greater than 10pax the cost of the headsets per person is 2.50€ for a half day tour and 5€ per person for a full day tour. Payment for the tour can be made in cash at the end of the tour directly to the guide, or in advance by PayPal with an additional 5% to cover the PayPal fees. Tours booked within ten days of the date of the tour must be paid in advance by PayPal. The Uffizi Gallery is closed on Mondays. On the first Sunday of the month between November – March inclusive all state museums in Italy are free without the possibility of making a ticket reservation. Card holders of the Firenze card will still need a timed ticket reservation to enter the Uffizi gallery. This is required to be made in advance however the standard reservation cost of 4€ is not applied for the booking. Cancellations made less than 48 hours prior to the tour start time require full payment.